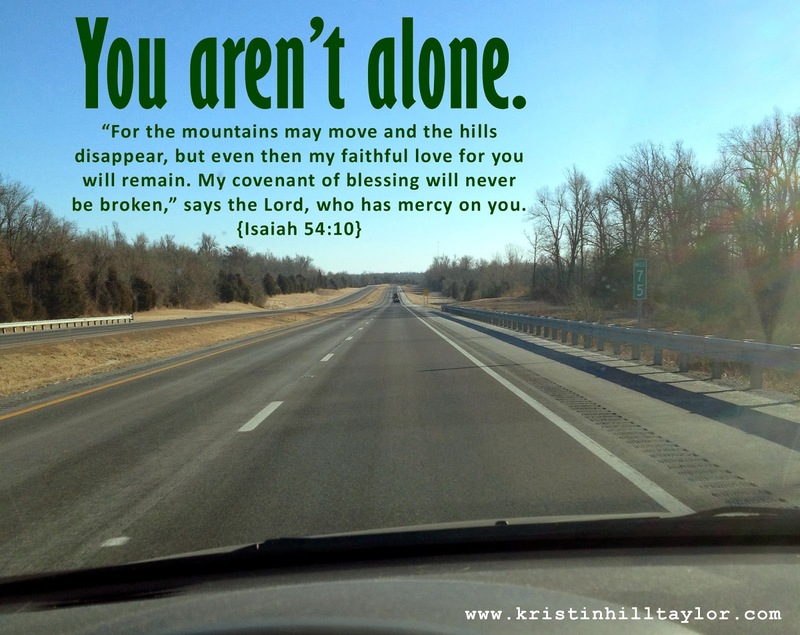 152 Insights to My Soul: You aren't alone. I drove the mini van 94 miles one way to a doctor's appointment this morning. Us mommas aren't alone like that very often. But, you know, I wasn't really alone on that stretch of highway that holds so much history for me. After I told them where I was going, my kids would tell you it's how we go to Grandmom's. I explained that I turned off that route before I got all the way to my mom's house. But I thought about my parents and my childhood home they don't live in anymore and all those trips back and forth from August 1997 to May 2001 when I was a college student. About four hours from the only home and life I had known and my college choice, that road bridged two realities and the transition of me beginning to build my own life. The same stretch of highway also took Greg and I to where we turned off to head north to meet Cate's birthmom various times between Jan. 18 and almost four months later on May 6, 2007, the day new life was born both in the literal sense and the way our family was forever changed. Today the radio and my iTunes playlists played songs that took me back to moments and reminded me of people. So I texted -- hooray voice text! -- a few friends, called another and Voxed another. Driving on the open reminds me to tell people they matter to me, probably because my journey through this life wouldn't be the same without them, despite the miles that separate. I made mental notes and actual notes because driving gives me room to breathe and think and remember and plan and dream. There weren't many cars on the road and there wasn't anyone else in my seven-passenger vehicle. But I wasn't actually alone. And that's the way God intended life to be. We were made for community. With him. With our family. With our friends. So even when I do get some quiet moments alone, the peace that comes reassures me I'm not alone on the open road of life. The memories, the sounds, the people, the destinations, and the silence blend together to create lovely scenery that I wouldn't trade for any other journey because this is the one God has for me. You aren't alone in your journey either. With this post, I'm joining Holley Gerth for her weekly community of encouragement when writers gather for Coffee for Your Heart and Beth Stiff, who hosts the lovely Three Word Wednesday. I'm so grateful to have crossed paths with you too, Kristin! Looking forward the real-life hang out ... some day! God is revealing the truth of your three words to me more than ever. I'm ever so grateful for community and grateful that no matter where I am, He is with me. Community is a favorite theme of mine, so I'm grateful you're experiencing so powerfully these days. Happy weekend, friend.